Just because you're wearing a bee suit doesn't mean you're not going to get stung. This is the first fact that all people venturing into beekeeping should know. I wasn't so lucky. 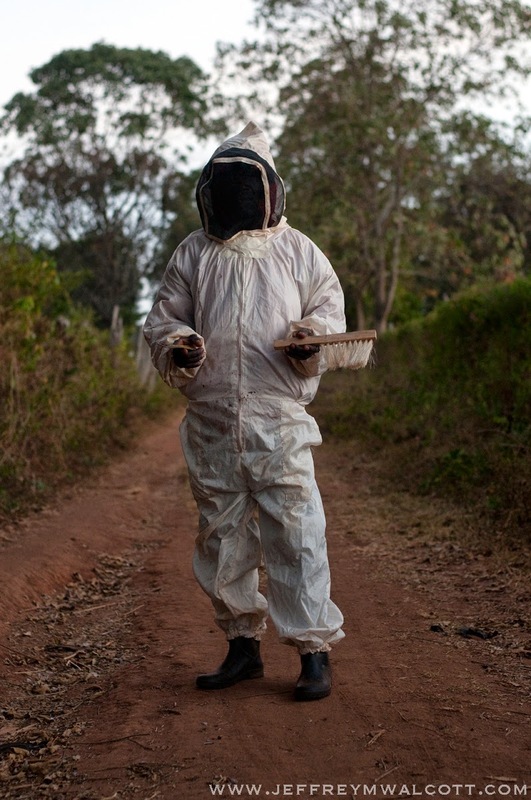 My realization that bees still penetrate the suit came with my first sting, a relatively alarming occurrence when you're embedded with a team of beekeepers performing maintenance on aggressive hives in the rural hills of Kenya in the pitch dark of night. "Um, guys," my shaky voice warbled, thinking the hundreds of bees swarming the outside of my face mask were suddenly about to swarm the inside of my face mask, "I'm getting stung." Daniel, the senior beekeeper in this outfit looked up at me and said, "It's fine. I've already been stung about ten times." And then he went back to work brushing down the interiors of the hives he was tending. His calm demeanor didn't reassure me especially as I could feel the now harmless bee, his stinger embedded in my arm, still crawling around my sleeve. But what was I to do? I had asked to come here. And these guys were professionals so they should definitely know. Both Daniel and Jacob, the other beekeeper diligently cleaning hives despite the pain of beestings, worked for an organization named Honeycare in Kenya. The group works to support local farmers that keep bees on their property. While the farmers own the hives, they don't tend to the bees themselves. This is the job of Honeycare. They travel throughout the countryside tending to the bees until, after about three months, the honey is ready to be harvested. They consolidate all the honey across Kenya and sell it to major grocery stores in the country. I had arrived at my present situation in the darkness of Kitale via a five-hour matatu ride north from Kisumu, the third largest city in Kenya. I didn't know what to expect and had no real knowledge of beekeeping prior to this. 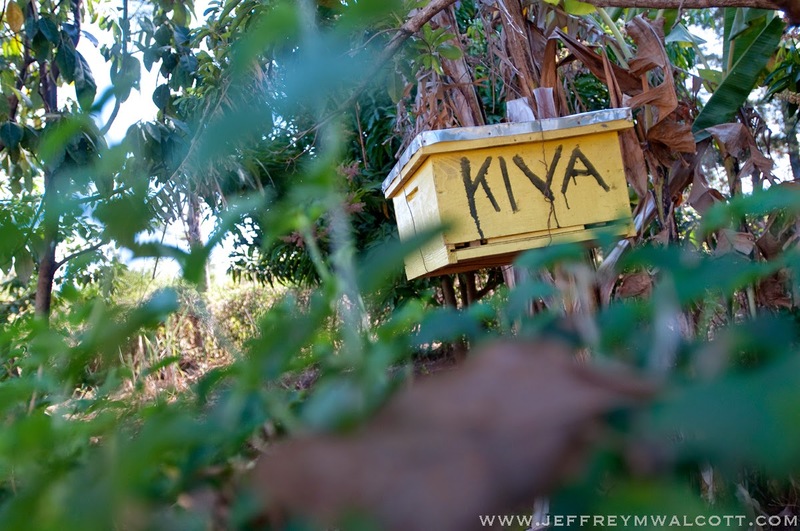 All had been set up through Kiva in Nairobi, who normally works to support the individual farmers in purchasing their bee boxes. 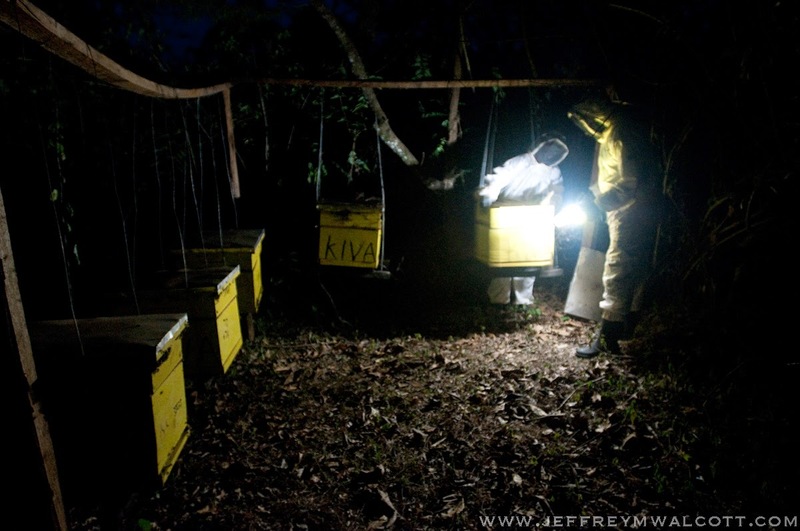 Most of the hives you'll find in Kitale, and definitely all those I encountered, featured the four letters of the organization boldly on the side. 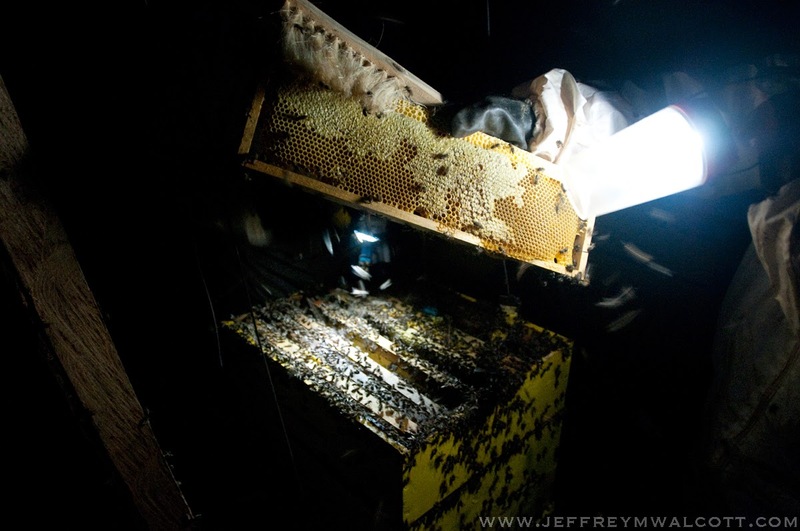 When I arrived, I was surprised to find that the workers only open the hives in the darkness, which isn't great for a photographer. Apparently the bees in the hives are aggressive, and may attack animals and people that happen to be in the area if the hives are opened. For this reason, they only work at night using flashlights. While I didn't know how this would affect my images, which was the purpose of my journey, I agreed to meet Daniel and Jacob at 6:30pm and as the sun set, we ventured by motorcycle into the hills of Kenya. Kitale, although well behind the other main attractions of a country like Kenya, is absolutely beautiful. Despite being smack in the middle of the dry season, the rolling hills were still green and monstrous trees dotted the roadside. Off the main roads the beauty increased, as narrow but well-maintained pathways of red clay dirt were bordered by tall hedges and even taller trees. We arrived at the first set of hives to be opened just as the sun was dipping below the horizon, casting its last brilliant hues of orange over the Kenyan landscape. 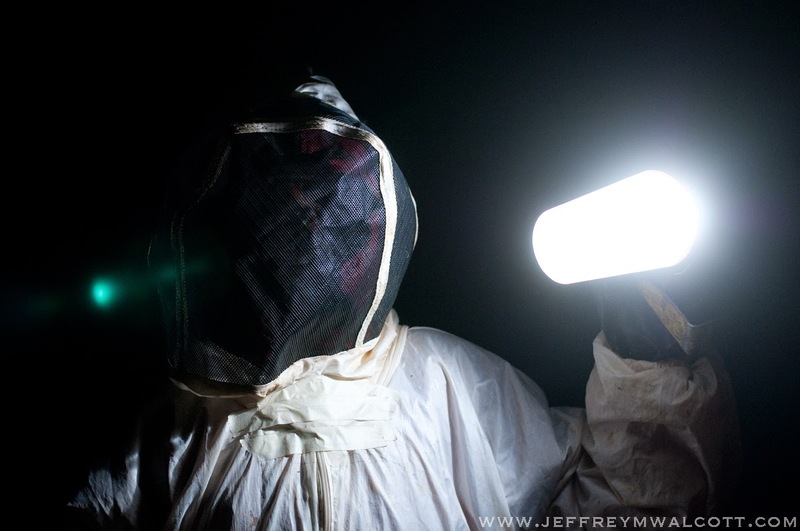 I was anxious to get a few photographs of Daniel and Jacob in their bee suits before complete darkness and this is when I recognized how surreal the situation was in which I found myself. 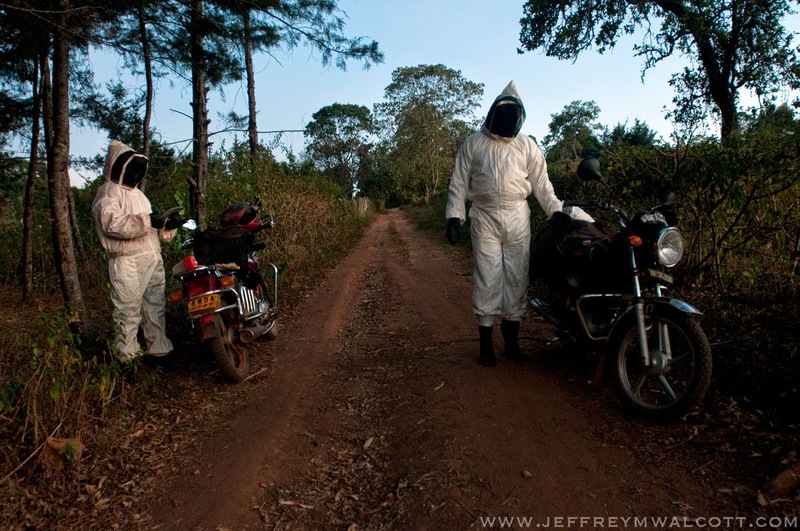 Here we were, in the fading light of day, stood on a dirt road, all wearing bee suits that made us look more space invader than bee farmer, with motorcycles in the background. It reminded me of a scene from a horribly written science fiction film, but this was my reality at the moment. As the final rays of light fell and the night enveloped us, we trudged into the woods, I with my camera and tripod, and Daniel and Jacob with their tools. I imagine working with bees at any point in time can be disorienting. As the boxes are opened they literally swarm and encompass every part of your body. The bee suits we were wearing were white and as I looked down through my mesh face mask I could see hundreds of tiny black dots scurrying along my body. It's enough to induce a panic attack. In the darkness its worse, as your sense of hearing becomes heightened and the roar of thousands of wings drowns out everything else. Photographing in a bee suit is difficult. Or this is what I found. You're not really able to look through a view finder because doing so would compress the face mask against your skin, which allows the bees to sting you. Face stings are always un-wanted. Always. So you pretty much point, shoot and hope for the best. Luckily I have a digital viewfinder on the back of my camera which helped me frame my shots but really didn't help with the focusing. And neither did the stings. But, it was a small price to pay - especially as I'm not allergic - for what happened next. The guys finished tending the first set of hives, which meant we had to travel to the others in the area. As the bees were still swarming, we couldn't remove our suits which meant at roughly 1030pm I found myself riding on the back of a motorcycle in a full bee suit, under a beautiful sky of stars. As I looked up I couldn't help but smile to myself about this incredible experience in Kenya.